We are on the verge of acquiring a significant new source of data to improve NOAA nautical charts, thanks to an enthusiastic industry and mariners equipped with new technology. The United States has about 3,400,000 square nautical miles of water within our coastal and Great Lakes jurisdiction. Coast Survey, who is responsible for charting that vast area, averages about 3,000 square nautical miles of hydrographic surveying each year. The data collected by those surveys update over a thousand NOAA charts. However, hydrographic surveys are expensive and laborious, and so Coast Survey directs them toward the highest priority sites, which leaves many coastal areas without updates for many years. Coast Survey may soon get new sources of information, provided voluntarily by mariners, which will alert cartographers to areas where shoaling and other changes to the seafloor have made the chart inaccurate. Rose Point Navigation Systems is working with system developers at NOAA’s National Centers for Environmental Information (NCEI) and with hydrographic experts at Coast Survey and others who are collaborating on an international effort to maintain crowdsourced bathymetry. In a beta test released on May 13, 2016, Rose Point has added a new feature to Coastal Explorer that gives users an option to send anonymous GPS position and soundings data to a new international database managed by NCEI. After getting permission from users, Rose Point systems will generate data log files of positions, depths, and time, and automatically transmit the files to the data center, where Coast Survey can pull the data to compare it to nautical charts. Using data from private sources is not new for Coast Survey. Private interactive cruising guides and other internet-based enterprises have set up services that allow commercial mariners and recreational boaters to share information about navigation hazards they see (or experience) while on the water. The United States Power Squadrons and the U.S. Coast Guard Auxiliary have a decades-long tradition of sharing updates through our cooperative charting programs. But the lack of appropriate software and integration between sources has hampered efforts to use the information to its full potential. Hydrographic offices around the world are re-thinking crowdsourced bathymetry. In October 2014, Coast Survey led the U.S. delegation to the Fifth Extraordinary International Hydrographic Conference, with Rear Admiral Gerd Glang at the helm. At this meeting, the U.S. and France jointly proposed an initiative (see Proposal No. 4) that introduced crowdsourced bathymetry as a recognized source of data for nautical charts. One of the results of that initiative was the formation of the IHO Crowdsourced Bathymetry Working Group (IHO CSBWG) that set out to develop crowdsourcing principles and guidelines, and then offer a platform for sharing best practices around the world. Working hand-in-hand with NCEI, the working group has developed a database that can receive volunteered bathymetric data. Data can come from anyone in the world, and everyone can access it. Crowdsourced reports serve an important role in focusing attention on trouble areas. The data helps cartographers determine whether a charted area needs to be re-surveyed, or if they can make changes based on the information at hand. 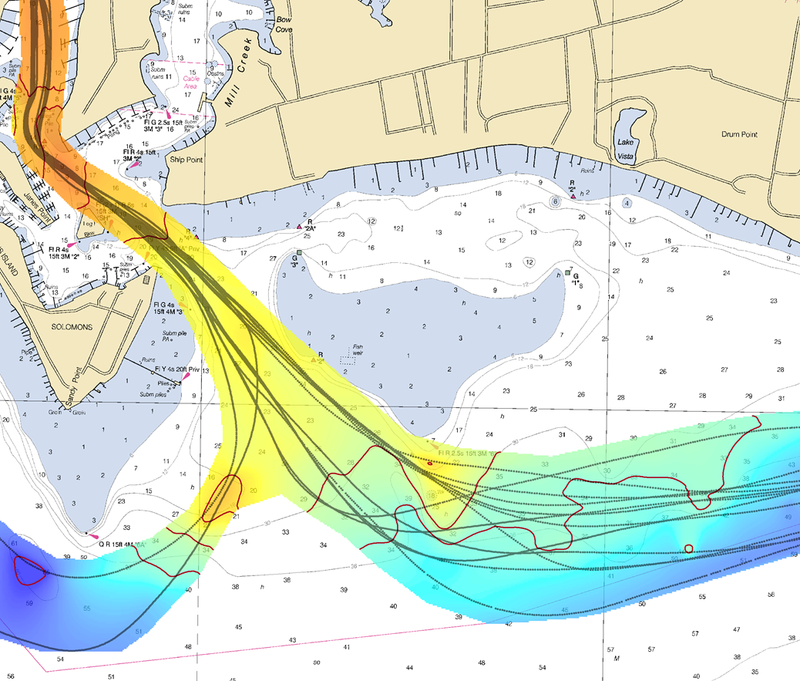 Even with very sparse data, cartographers can make improvements to nautical charts. Coast Survey Research Vessel Bay Hydro II collected about 123,000 soundings, over 12 days, to pre-test the efficacy of Rose Point beta test for bathymetric crowdsourcing. It is important to emphasize that Coast Survey does not necessarily make changes to any significant charted feature based on crowdsourced data alone. That data, however, is about to become a major factor in making charts better.